What’s it about? Moments before defeating the Demon Lord, the hero Yusha wishes for a world where she and her friends can live in peace. That wish is granted by turning back time to before she was a hero, when she enjoyed life at the Hero Academy with her friends. But she’s not the only one who slipped through time, and now the Demon Lord is here with her at her most vulnerable. Who’s ready for a pastel-shaded “cute girls doing cute things” show? The audience for ENDRO sure is! I’ve softened on moe and “cute girls” shows over the years. It was hard to get over them at a time when they dominated the anime airwaves, but as the selection of anime releases has gotten more diverse, it’s gotten easier to accept them as simply “not for me.” Sure, we get cutesy faffing about here, but with great female characters like The Promised Neverland’s Emma and the pilots of Kotobuki even in a lean season like this one, it’s hard to get upset. Besides, with the growing trend of slavery–fetishism shows, there’s worse things to worry about. Besides, sometimes cute girls just wanna have fun, and sometimes audiences want to have fun watching those cute girls have fun, and that’s the main thrust of ENDRO! The first episode is quite slight, focused primarily on RPG-inspired humor relating to things like classes and monster-slaying. It never exactly tickled my funny bone, but I can certainly see the appeal. For me, the most memorable joke is a sight gag of their new teacher being too small to see over the podium, so she just keeps jumping up and down while trying to talk to them. The story and writing are perfectly acceptable. To me, the biggest issue comes from the character and costume designs. 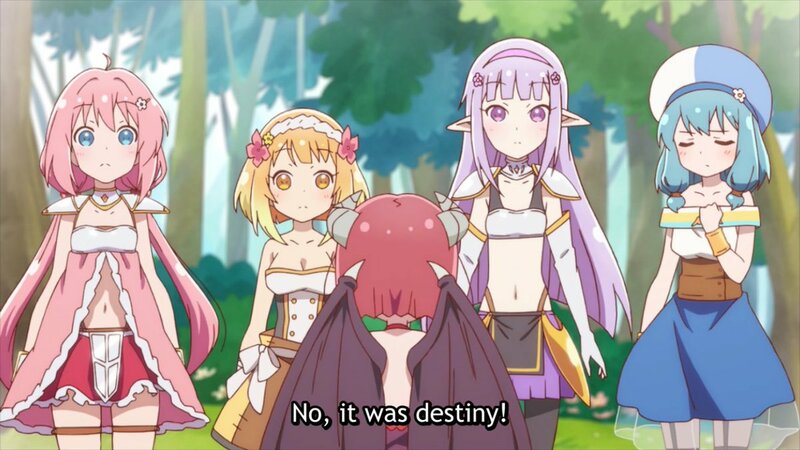 ENDRO starts with Yusha and her party as fully mature heroes, putting up a powerful fight against the Demon Lord and ultimately coming out victorious. Sure, they’re drawn like three-year-olds, but this is just how things tend to go—but then, when they enter the timeslip and end up back at the start of their schooling as heroes, they look exactly the same. You would expect something to be different! Maybe as heroes they have better armor, or look older, or a more muscular physique. Characters at the end of their journey do not look exactly like they did as children. Goku in Dragonball doesn’t look like Goku in Dragonball Z; Deku in My Hero Academia has to put on muscle before he can take on All Might’s powers. Having Yusha as a kid starting school look identical to Yusha when she defeats the Demon Lord is just poor character design. This is exacerbated by the costume design, which is some of the worst I’ve seen in a long time. Yusha dons what is essentially battle lingerie, complete with a ruffled top that spreads out to reveal her entire midriff. Warrior Fai wears a tube top. Character designer Namori (Yuru Yuri, Release the Spyce) may have a sizable fan following, but I am not among them. I doubt ENDRO is going to take the anime community by storm. It’s cute, it’s funny, it’ll probably have a solid enough following for exactly one season. Then, much like Yusha and her party in the first episode, it will likely disappear into the annals of time.